Welcome to the two hundred and eighty-third of my blog interviews with novelists, poets, short story authors, biographers, agents, publishers and more. 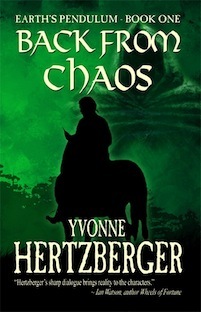 Today’s is with epic fantasy author Yvonne Hertzberger (whose birthday it is today!). A list of interviewees (blogged and scheduled) can be found here. If you like what you read, please do go and investigate further. Morgen: Hello, Yvonne. Firstly Happy Birthday. 🙂 Please tell us something about yourself and how you came to be a writer. Yvonne: Once upon a time, a long time ago, (six years or so) someone told me, “Write. I don’t care what you write. Just write”. I wrote a couple of short stories and then started what I thought would be another. But as I wrote characters popped into my head, plots seemed unfinished and possibilities presented themselves. And so began the Trilogy “Earth’s Pendulum”. I had many (possibly too many) friends read my first manuscript and tell me what they thought. What they told me led me to believe that I am indeed a ‘writer’. “Back From Chaos” sold roughly 350 copies, primarily the result of my own efforts. At first I said that I write. Now, with the sequel “Through Kestrel’s Eyes published, and both books getting great reviews, I call myself a writer. Morgen: Yay! I started six years ago too, from crime writer Sally Spedding’s evening classes (which I took over in 2008 when she moved to Wales) and I was hooked to the point where I’ve now given up my job (five working days to go!). What genre do you generally write and have you considered other genres? Yvonne: The only genre I have written is Fantasy, Epic Fantasy according to some definitions. I do not see myself branching out into another genre at this time but do not preclude that possibility. The future is not written in stone. Morgen: I can’t stick to a genre. I read crime and chick lit so write dark and light but that’s about as defined as it gets, which I think for eBooks doesn’t matter so much and if you start off mixed you can get away with it more. 🙂 What have you had published to-date? If applicable, can you remember where you saw your first book on the shelves? Yvonne: Since “Back From Chaos: Book One of Earth’s Pendulum” is self-published and POD I convinced only two bookstores to actually buy copies for their shelves. Four more took a few on consignment. Seeing it there gave me a sense of legitimacy. Yvonne: Oh wouldn’t that be wonderful! But, sadly, no. Morgen: Yet. 🙂 How much of the marketing do you do for your published works or indeed for yourself as a ‘brand’? Morgen: I used to be. I’ve been coming out of my shell the past few years. Now I’ll go up to anyone. 🙂 Have you won or been shortlisted in any competitions and do you think they help with a writer’s success? Morgen: Absolutely (and I voted for you, by the way). Self published used to have a bad reputation but eBooks have changed all that and I am so grateful. I love being a writer now. Do you write under a pseudonym? Do you think they make a difference to an author’s profile? Yvonne: I use my own name. I know some people fear stalkers but I live in a very safe community where well known actors and musicians mingle with the other inhabitants and blend in without being harassed. It seems unique in that regard. Morgen: I think authors are probably one of the safest. Unless readers take note of our dust jacket pictures or find us online no-one knows what we look like… she says with only eBooks and those include my caricature. 🙂 Do you have an agent? Do you think they’re vital to an author’s success? Yvonne: I do not have an agent and at this point all indications are that having one will not enhance my profile or landing that coveted contract. I also like the idea of retaining total control over my product, which I could lose with an agent and traditional publisher. Morgen: Oh yeah, me too. 🙂 My only expense is a professional editor and she’s worth every penny. Are your books available as eBooks? If so what was your experience of that process? And do you read eBooks? Yvonne: Both books are available on Kindle.” Back From Chaos” for $0.99 (I took back the rights and revised it, then republished it) to entice new readers and “Through Kestrel’s Eyes” for $2.99. I just bought a Kindle and have read about five books there so far with more waiting to be read. Many of these are ones recommended by friends or ones written by some of my on-line friends that caught my eye. Hey – we’re good! Morgen: 🙂 I bought a Kindle recently and love having out with me although I’ve not read much more than a shortish short story (one of Stephen Leather’s). Have you had any rejections? If so, how do you deal with them? Yvonne: I did some research to see what my chances of landing a publisher were as a first time, fiction, niche writer. I learned it would be easier to win the lottery. So I did not even go that route. At my age (63 today) I do not have the luxury of waiting 20 years to be discovered. I have a good story that I want available to readers now. Morgen: That’s the wonderful thing about eBooks; once they’re ready they can be online in minutes. Traditional publishing can easily take a year. What are you working on at the moment / next? Yvonne: The last instalment in the Earth’s Pendulum trilogy, “The Dreamt Child” is underway. After that, who knows? I toy with the idea of continuing in the world I have created but that is not set in stone. Morgen: It’s a well-known fact that readers love series. With anything, if there’s something we like, we want more of it. 🙂 Do you manage to write every day? What’s the most you’ve written in a day? Morgen: Writers can get away with staring out the window. I once wrote about a girl staring out of a window so it was research. 🙂 What is your opinion of writer’s block? Do you ever suffer from it? If so, how do you ‘cure’ it? Yvonne: I do occasionally wonder where I will go next but that does not last long once I sit down in front of my computer. I have only suffered a real writer’s block once. That was early on when I made the mistake of letting someone who sees himself as the perfect critic read part of the manuscript. It blocked me for three months. Now I am very choosy about who I show my work to. Morgen: Oh dear. But by now you probably know your work well enough to mould the critique you get. Apart from finding errors (fortunately not usually many) but my editor comes up with wonderful suggestions. A question some authors dread: where do you get your inspiration from? Yvonne: The honest answer is I don’t know. I think it is a combination of insight into human behaviour, imagining how someone might overcome adversity and grow stronger from it, and hard work. I don’t have a muse, so to speak, just a goal. The path presents itself as I write. Morgen: That’s my favourite aspect of writing; the unknown. Do you plot your stories or do you just get an idea and run with it? Yvonne: I have a general idea of where I start, where I want to end up, and a few key events along the way. But I do not plot out time lines or have a post-it-note board up with an order in which things must happen. I find that stifling. It makes me feel boxed in and kills my creativity. As long as I have that vague idea the story generally presents itself to me, almost as if it has a life of its own that needs to be brought to light. That may be because my characters tell me the story. It often feels like they are real people wanting to let me know them, not like I am creating them. Morgen: Speaking of which, do you have a method for creating your characters, their names and what do you think makes them believable? Yvonne: Since my ‘world’ is not real, and it takes place in a distant past, I try to create names that evoke the society my characters live in. Very rarely do I use names a reader would recognise unless it also fits in with the language I picture them using. That’s why I add a character list with a pronunciation guide at the beginning of the book. But I also try not to make them too complicated. I think if a reader has to struggle too much with the names it could prevent them from becoming immersed in the story. And since I write Epic Fantasy I have many characters, whereas a single novel might have only a handful. I don’t want the names to become a barrier to enjoying the story. Morgen: I love the idea of a pronunciation guide. Most readers love maps etc. I loved Kate Atkinson’s first book once I’d read it all (and went on to buy everything she’s published – she’s still my favourite living writer) but a family tree would have been really handy. I was studying her at the time and so drew my own. 🙂 Do you write any non-fiction? Yvonne: I do not write non-fiction. Writing, (and, often reading) are an escape from the real world into a place where I can create solutions to problems – not happy-ever-afters, but new ways of looking at common issues. Yvonne: I leave the poetry to my spouse. 🙂 He is much better at it than I.
Morgen: I try to avoid it. I do limericks for my Facebook friends (as you know because I did one for you today :)) but that’s about as close as it gets. Occasionally I submit to free competitions but I don’t get anyway… but it gets me writing. I’ve never really been taught it but have two poets in my Monday night critique group who are brilliant so I leave it to them (and am usually the one who has the least to critique about them). Yvonne: Someone once said, to paraphrase rather badly, that prose is ‘good words, well put together’ and poetry is ‘the best words put together in the best way’. I know a man who writes what he calls ‘narrative poetry’. It seems to fall somewhere in between the two. I have heard that poetry is regaining popularity. But it is very specialised. Perhaps the pay is so poor because poetry is ‘writing’. Not many writers make the big bucks. I know, too, that poets tend to spend a lot of time saying something with very few words. It takes a lot of effort to get enough together for a whole book. Yvonne: I have written only a few short stories and never tried to get one published. One complaint I hear is that the criteria are so rigid that they do not allow for creative character development and in depth resolutions to the presenting problem, even if that problem is simple. That is why I prefer to write novels as well. They give me the scope to flesh out my characters and tell their story with some depth. That does not mean that I do not enjoy reading a good short story. I am often amazed by what some authors can say with so few words. Morgen: One of my latest for Tuesday Tales is 141 words and one of my Monday nighters suggested I chop a couple of words! Are you involved in anything else writing-related other than actual writing or marketing of your writing? Yvonne: I have occasionally been moved to write an opinion piece for a newspaper or a letter to the editor. Some actually got published. 🙂 My politics are generally not popular as they do not fit the mainstream, which tends to get the pieces rejected. Morgen: By editors not brave enough I’d say. We love political wrangling over here. 🙂 Who is your first reader – who do you first show your work to? Yvonne: I still edit but it has become much less as I learn to write more concisely. With “Back From Chaos” I cut 30% with the first rewrite. With “Through Kestrel’s Eyes” I did not lose much, just tightened things up and reworded things. Morgen: I wrote a 117,540-word chick lit for NaNoWriMo in 2009 and four edits got it down to 105K but am now thinking of splitting it into connected stories so each character has his / her own story so I’m sure a lot of that will go. How much research do you have to do for your writing? Yvonne: I have read extensively about early agrarian societies and have also researched early farming, animal husbandry, herbal and folk medicine. I grew up on farms, so I learned a lot there. Fantasy does not require accuracy in the setting but when it comes to remedies I do feel I need to be correct. Morgen: Because someone is bound to pick you up on it if not. What is your creative process like? What happens before sitting down to write? Yvonne: I spend a lot of time thinking, letting ideas percolate as I do housework, garden or walk. If a particular situation still is daunting I will talk with a writer friend or Mark about it. Talking it out aloud is often helpful. Morgen: It is! Reading your work out loud picks out the errors much easier – it’s surprising. Do you write on paper or do you prefer a computer? Morgen: My handwriting’s not bad but it’s so much slower these days. Some writers like quiet, others the noise of a coffee shop etc. Do you listen to music or have noise around you when you write or do you need silence? Yvonne: I have to have quiet with no distractions, not even background music. But I still like to be part of things, not holed up in a separate room. So my writing space is in the living area of our small house where I can see around me. Mark has his separate office so he does not interfere with my process at all. Yvonne: Second person does not entice me at all. But my first book is in the multiple third person, the second is in first person. Both have their good and bad points but I liked the extra challenge writing in the first person gave me. I think it added a measure of ‘realness’ to the character, and hence the story. In “The Dreamt Child” I am splitting it between the two main characters, both in first person. Guess I will have to make sure they each have a very distinctive voice. But I love a challenge. Morgen: Ah ha, then you must try second person. I know you’ve read some of my Tuesday Tales second-person pieces so it may grow on you. That said I write short (short) stories which suit second-person and you write novels which even Jay McInerney didn’t really (imho) get away with doing a novella in. I started it years ago and pick it up every now and then, but then it’s a fairly dull book so hard going anyway. 🙂 Do you use prologues / epilogues? What do you think of the use of them? Yvonne: I do use both, primarily to provide a logical link between books, for those who may have forgotten what happened in the previous book or to introduce a new reader who has not read the first volume. Actually I agonized over including the prologue in “Through Kestrel’s Eyes” because I thought the beginning of the first chapter was a better ‘grabber’ than the prologue. In the end I did leave it in. It’s very short. Morgen: I used not to read them but then was reading Trisha Ashley’s ‘Twelve Days of Christmas’ and was so glad I did – it was lovely, and gave me character background. But, yes, helped by the fact that it was short. Do you have pieces of work that you think will never see light of day? Morgen: But you’re more practiced now so you can hack them. 🙂 What’s your favourite / least favourite aspect of your writing life? Yvonne: Technology and media are both huge challenges for me. I am learning all about computers, media, networking and internet at a late stage in my life. Unlike the young set, these things are not second nature to me. And they take a great deal of time, both to master and to keep up with. I find that promotion, marketing and networking take an inordinate amount of time, likely more for me than most. I resent that. Grrrr. Morgen: Oh I don’t think so. Computers eat time. I have a Mac and it’s pretty quick (SO much less trouble than my previous PCs) but there are still times when I’m waiting for something and I think that if I added all those seconds up, I’d be losing a day or two here or there. If anything, what has been your biggest surprise about writing? Yvonne: That anyone actually wants to read it, that they think it is good and enjoy it. That never ceases to amaze me. Morgen: Ah… I had an email from a young (<13) lady the other day who loved April’s Fool and wanted to know more. I’m still grinning from it. What advice would you give aspiring writers? Yvonne: Read voraciously. Write constantly. Learn ALL the rules (that never ends, by the way) so that when you break them you do it with conscious intent and can justify it. Show your work only to people you trust to be supportive but still honest. Know your own voice and stay true to it, even if others are critical of it. It is YOUR writing, not theirs. At the same time listen to considered feedback and only reject it if you have understood it and know why you disagree. That is one way to know what your voice is. Morgen: Absolutely, and you learn by practice – writing. 🙂 What do you like to read? Any authors you could recommend? Yvonne: In fantasy I love all of Robin Hobb’s books, especially the “Liveship Traders” series. Also Juliet Marillier’s “Sevenwaters” series. Another writer I like, but in regular fiction is Anne Marie MacDonald, author of “Fall On Your Knees”. And I liked Tom Kepler’s “The Stone Dragon” and Rosanne Dingli’s “According to Luke”. I will read more of theirs. Morgen: That’s what writing is all about; having your readers wanting more. (Hi Rosanne!) Is there a word, phrase or quote you like? Yvonne: “There is no such thing as ‘can’t’”. Yvonne: I sing in the Stratford Concert Choir. Mostly classical but some show tunes and more modern serious pieces – I am a high soprano. 🙂 I love to garden, decorate, do many crafts. No party tricks, though if I let loose I can occasionally be a good mimic. Morgen: Absolutely. I’ve met some wonderful people (including yourself and Rosanne :)) there. In which country are you based and do you find this a help or hindrance with letting people know about your work? Yvonne: I live in Canada. But I have made so many connections in countries all over the world that I do not see it has having an effect. Being here with you is a good example. I suppose in underdeveloped countries it would be more difficult but on the whole I believe we live in a global community now and barriers are falling all the time. Morgen: They are and isn’t it great. 🙂 Are you on any forums or networking sites? If so, how valuable do you find them? Yvonne: I do participate in a couple of threads on Linkedin, and now have joined Indies Unlimited. I am also a member of a local writers group. Morgen: Ditto. I joined IU last week – like Tuesday Tales it’s getting me writing a new story a week. 🙂 Where can we find out about you and your work? Yvonne: Thank you, yes. My author page at Amazon.com, my Facebook fan page, my website/blog and Twitter @YHERTZBE. Yvonne: The world of writing and publishing is undergoing huge changes. At this point it is difficult to know where we are going but I expect that media and technology will play an increasing role. I do think that twenty years from now we may have a hard time recognising the way we do things today. But I think there will always be a place for original and classic written works. I am often encouraged when I see young people enjoying books. And my daughter thinks she may want to be an editor – how about that? Morgen: Yay! I was destined to be something creative – a photographer father / uncle, aunt and mother who are artists and a web designer (though now IT Project Manager) brother. 🙂 If you could have your life over again, is there anything you’d have done differently (writing-related or otherwise)? Yvonne: I do not know anyone who does not wish some aspect of their life had been different or does not regret certain decisions they made. On the other hand, I would not be the person I am today if my life had been different. I think if one challenge is avoided another comes to take its place, and the regrets we have now will become other regrets. My life was not a piece of cake (and that is a huge understatement) but I like where I am going now. That might not be so if I had had other experiences. Morgen: And the great thing is we can write about them. Is there anything else you’d like to mention? Yvonne: Oooooh! Carte blanche! lol Actually you have asked all the right questions so we have pretty much tapped the well. But I do want to thank you for hosting me here. I am honoured. Morgen: And I’m thrilled to have you here. You’re my third commenter on the blog and it’s so appreciated by me and my guests. 🙂 Is there anything you’d like to ask me? Morgen: Sometimes. I have a reminder on my computer that goes off at 9.30 every night but I just mock it and switch it off, usually going to bed three or four (sometimes five) hours later. I’m thinking of changing it to midnight so I mock it (hurt its feelings) less. 🙂 Thank you Yvonne and I hope you have a wonderful birthday. I felt no pain now; not the weariness from my headlong flight, not the burning of the pain in my fingers, nor the bone deep chill in my limbs. The cold brought peace and the desire to sleep. If this was what Earth wished for me, I resigned myself. This sleep would be my last. As if from far away I became aware of the sound of voices. Almost unconscious, I had not the strength to move and so could not indicate to them that I lived. Truth be told, I knew I hovered near death. Perhaps Earth had no further need of me and would allow me to sink back into her eternal embrace. Is that what I wanted, to be free from my duties to Earth, released from my gifts? I had not had a choice in receiving them. Perhaps rescue would be no more than a wishful dream. But no, this was real. I had been found. The voices above me penetrated dimly through the foggy haze of my awareness. “Ho, what is this?” I heard one mumble as he stumbled over my cocoon of branches, leaves and snow, and his boot uncovered a patch of my red cloak. With my seer’s sight I sensed him scrabble the remaining cover of snow, leaves and branches away with his hands. Update September 2012: “I am now a contributing member of Indies Unlimited. I love that group. I have learned so much from them, received so much support there and have an opportunity to give something back to the writing community. I don’t know if you recall but we actually discussed the spelling of dreamt or dreamed. Both are correct so I chose dreamt as it has a more old-world feel. On another note, I wish I could delete the references to iUniverse. I have learned since then, that they are on the list of companies that prey on unsuspecting new writers, charging them large fees for what they can easily accomplish on their own. Nor am I happy with the editing they did. There were still numerous errors after the copy-edit and proof-read I paid for. My book is no longer listed with them, though I still see the ebook for $9.95 when I have it for $2.99 on Kindle and Smashwords. Oh, that reminds me, Both books are available on Smashwords and all their outlets now. You seem to have cracked it though! Yay! Great interview, great sounding books….. dashes off to see if they are on Amazon.co.uk ….. Thank you so much for having me here Morgen. You have been, and continue to be, so supportive. Helen, thank you for your comment. And thank you for wanting to check out my books. That is the best outcome! 🙂 As for amazon.uk – I did buy the extended distribution package from amazon so it should be there. I’m not sure how to check it. Morgen – do you know? I did a search on Amazon.co.uk and your books are on http://www.amazon.co.uk/s/ref=nb_sb_noss?url=search-alias%3Daps&field-keywords=yvonne+hertzberger&x=0&y=0. That list brings up 7 choices whereas if you just click on your name in any of the book’s pages it only shows three. Bet you can’t wait for March 2nd. Congratulations. All the best. Thanks for checking the amazon link. Good to know it is there.